Traditional monolayer cell culture or two dimensional (2D) cell cultures have provided the nascent interpretation of complex biological phenomena. However, the interactions between the cells and its microenvironment govern various processes such as differentiation, proliferation and gene expressions in regulation of tumor initiation and progression. Therefore recent work has shown that cells often exhibit unnatural behaviour when they are excised from native three dimensional (3D) tissues and confined to a monolayer. The spheroid model is one of the popular 3D structures used to mimic tumor microenvironment except that this model omits the important influence of the cell-stroma interaction on tumor cell proliferation and progression. Thus despite the heterotypic co-culture between breast cancer cells and fibroblasts in a scaffold free construct, the model did not fully represent the in vivo microenvironment of the tumor due to the absence of the tumor-extracellular matrix (ECM) component . Thereby it has been shown that scaffolds made of biocompatible, bioresorbable and biodegradable polymers promote recapitulation of tumor microenvironment underlying interactions between cells and their stroma . These 3D scaffolds induce changes in cell shape and cell cluster arrangement not observed in cells grown in 2D on plastic or isolated individual components of the ECM. Furthermore, cell function differences have been demonstrated between 2D and 3D cultures by Bissell et al. in human breast epithelial cells which develop tumor cell like behaviour when cultured in two dimensions, but revert to normal growth behaviour when cultured in 3D analogs of their native microenvironment . Three dimensional cell cultures retain a high potential to be improved by creating a more native-like environment to reflect the biological response to substances more closely. In order to comprehend the complexity of the cell biology research, it is important that the cell culture based models incorporate both the 3D organization and the multi-cellular complexity. Recently, tumor engineering has been defined by Ghajar and Bissell as “the construction of complex culture models that recapitulate aspects of the in vivo tumor microenvironment to study the dynamics of tumor development, progression and therapy at multiple scales” . Some of the most recent work involves co-culture of cancer cells in 3D along with other cells normally found in the tumor microenvironment [5,6]. It is expected that the 3D co-culture arrangement can replicate the dynamism existing between the cells and surrounding ECM more effectively. Effectively many attempts have been realized to recapitulate and mimic this dynamism in vitro [7,8]. This 3D co-culture may help to re-examine molecular signaling pathways characterized previously by conventional methodologies. Tlsty et al. have reported that stroma and cancer associated fibroblasts can invert epithelial cell behaviour from non-malignant to malignant in 3D structures. These oncogenic activities are thought to be carried out through a combination of ways including manipulation of matrix metalloproteinase (MMP) . Yet only few groups have attempted tumor-Angiogenesis in a 3D configuration [10-14]. Fischbach et al. have detailed that angiogenic characteristics of tumor cells that are dramatically altered upon 3D culture, the tumor cells cultured in a 3D microenvironment led to a vascular endothelial growth factor (VEGF) and IL-8 profile similar to in vivo profiles . In their system they used PLG scaffolds which are considered to be synthetic therefore obliterating the cell-matrix effect. However, Bray et al. have performed a tri-culture consisting of different stromal components and cancer cells in a 3D microenvironment represented by a polyethylene glycol (PEG)-heparin cross linked hydrogel in order to study the role of the microenvironment and vascular signals in cancer progression . In our 3D system composed of a cross-linked hyaluronic acid hydrogel, the effects of cell-matrix in addition to tumor cell-cell interplay have been outlined both for different tumor cell types as well as for hematopoietic stem cells (HSC) [15-18]. Thus we have used our system for testing drug efficiency as well as in the proliferation and maintenance of stem cells. However despite the resemblance of our 3D monoculture system with the in vivo avascular tumor microenvironment, the interaction between different cell types was absent. Therefore we needed to improve our research model in order to elucidate the role of endothelial cells in cancer progression. The overall aim of this study will be globally to mimic the tumor microenvironment; this would aim more precisely to understand inter/ intra cellular and cell-matrix interactions, in addition to identify how the presence of the endothelial cells in the tumor microenvironment can affect tumorigenesis. Altogether, this project tends to assure a tumor-endothelial 3D co-culture tool that can be used for studying the influence of these cells on each other’s behaviour; this could extend to a better understanding of the neovascularization of micro tissues and lastly the angiogenic signaling pathways. Hyaluronan hydrogels consisted of a long-chain of hyaluronan cross-linked with adipic dihydrazide (ADH; Sigma-Aldrich, France) and 1-ethyl-3[3-(dimethyl amino)-propyl] carbodiimide (EDCI; Sigma-Aldrich). All the hydrogels were prepared from high molecular weight hyaluronan (>106 Da; Sigma-Aldrich) according to the procedure described by Prestwich et al. . Briefly, the ratios ADH: hyaluronan and hyaluronan: EDCI were adjusted to obtain a cross-linked hydrogels optimized for cell adhesion and culture. The optimal conditions for cell proliferation and adhesion were obtained with an ADH: hyaluronan ratio of 10:1 and a hyaluronan: EDCI ratio of 1:1. Hyaluronan and hydrazide cross-linker (ADH) were dissolved in milliQ-water and the pH was adjusted to 4.6 by adding 0.1 N HCl. The carbodiimide reagent (EDCI) was dissolved in milliQ-water, added to the reaction mixture and allowed to polymerize for 2 h with gentle agitation. Hyaluronan hydrogels were dialysed against 0.1 N NaCl for 2 days, then in water: ethanol mixture (3:1 v/v) for 2 days and in milliQ-water for 2 days to remove unreacted ADH and EDCI. Each dialysed hydrogel is placed in a plastic container and frozen. Following freezing, the hydrogels are placed in a lyophilizer (Alpha 1-2, Christ, Germany; performances, 2 kg ice/24 h, T=-55°C). Depending on the volume of water to be eliminated, the lyophilisation was carried out for 4-5 days. The lyophilized hydrogels were then stored at -20°C. Lyophilized hydrogels were cut into rectangular parallelepipeds (about 1 mm3) prior to use. The cut hydrogels were sterilized at 100°C and then rehydrated in culture medium (Roswell Park Memorial Institute 1640 (RPMI1640), Eurobio, France). The gel pH post-rehydration was approximately 8.4 and the swelling ratio of hyaluronan hydrogels at room temperature in RPMI medium was 37 g/g. The invasive mammary cancer cell line MDA-MB-231 was obtained from ATCC Germany. MDA-MB-231 cells were grown in RPMI supplemented with 10% (v/v) heat-inactivated FBS, and 1% (2 mM) L-glutamine (Gibco, Invitrogen, France) and 0.1% of Penicillin/ streptomycin antibiotics incubated in a humidified atmosphere of 5% CO2 at 37°C. The human microvascular endothelial cell line (HMEC-1) was provided by Dr. Ades (Center for disease control and prevention, Atlanta, GA). HMEC-1 were cultured in MCDB-131 medium (Sigma, France) supplemented with 15% (v/v) heat-inactivated FBS and 10 ng.mL-1 epidermal growth factor (EGF), 1 mg.mL-1 hydrocortisone and 0.1% of Penicillin/streptomycin antibiotics incubated in a humidified atmosphere of 5% CO2 at 37°C. In each well, 1 × 106 of either MDA-MB-231 or HMEC-1, for co-culture experiments 5 × 105 of both MDA-MB-231 and HMEC-1 were mixed in different ratios, and then are cultured in a total volume of 2 mL of culture medium. Ten hyaluronan hydrogels, prepared as described above, are placed in each culture well. The cultures are incubated for one day in contact with cells, and then incubated in a new well containing fresh culture medium during 5 days. After which, HA hydrogels are incubated in a new well containing fresh culture medium at 37°C; 5% CO2 during 6 days. The culture medium is changed every 6 days afterwards. Single cell spheroids and those of co-culture, formed in the hyaluronan hydrogel, were stained using live/dead cytotoxicity/ viability kit for mammalian cells (Life Technologies, France). The live cells are stained with calcium AM, which emit green fluorescence light (517 nm); while the dead cells are stained with ethidium homodimer-1 (Eth-1), which emits red fluorescence light (617 nm). The two components were added to PBS (Gibco, France), each at a concentration of 2.5 μg.mL-1 and 0.75 μg.mL-1, respectively. Hydrogels with spheroids were incubated in the solution for 30 min at 4°C. After rinsing with PBS, spheroids were observed using a M200 microscope (Zeiss, Germany). Time phase microscopy was done during the first 24 h of coculturing MDA-MB-231 and HMEC-1 cells in the hyaluronic acid. Before culturing cells in the hyaluronic acid, the MDA-MB-231 cells were stained with cell tracker green CMFDA (molecular probes; Invitrogen, France) while HMEC-1 cells were stained with cell tracker red CMTPX (molecular probes; Invitrogen, France). Then the cell rearrangement was observed using a M200 microscope (Zeiss, Germany) for 24 h.
Cells were cultured either as a simple 3D culture system or in a 3D co-culture system in different HMEC-1/MDA-MB-231 ratios (1:3, 1:2, 1:1, 2:1 and 3:1) for testing optimal cell proliferation, as mentioned above. After which cell proliferation was detected by adding WST- 1 reagent (Roche Applied Sciences, France) at a dilution of 10:1 to the seeding well. Hydrogels were incubated at 37°C for 4 h and 70 μL WST-1/medium solution was transferred to 96-well plate. To establish a standard curve, optical densities were measured at 420 nm and 620 nm using a micro plate spectrophotometer (Power wave X, Bio-tek instruments, France). The absorbance directly correlates with the number of viable cells. All experiments were done in triplicate. Proteins were extracted from the cells cultured in the hyaluronan hydrogel using chilled lysis buffer containing 1% (v/v) Triton (Sigma- Aldrich, France), 50 mM Tris-HCl (Sigma-Aldrich, France) pH 8.0, 150 mM NaCl, 1 mM MgCl2, and complete mini protease inhibitor cocktail with EDTA (Roche Diagnostics, France). Lysates were clarified by centrifugation at 15,000 rpm for 3 min; supernatants were stored at -80°C before use. Total protein content determination was done by Bradford technique. Monocultures and co-cultures in the 3D system were prepared as mentioned previously. After 6 and 12 days of 3D culture, protein extraction was performed as mentioned above. Western blots are performed on the Xcell II system (Invitrogen, France) according to the manufacturer’s protocol. Briefly, 30 μg of proteins were diluted in a loading buffer, heated for 5 min at 5°C, then size separated in a 10% Tris-glycine SDS polyacrylamide gel (Invitrogen, France), and transferred to a 0.2 μM nitrocellulose membrane (GE healthcare, Amersham, UK). Membranes were blocked with 5% BSA and then blocked membranes were incubated with either rabbit anti-P38 MAPK or rabbit anti-ERK ½ monoclonal antibodies (cell signaling, France) at 1:2000 dilutions with goat anti rabbit horseradish peroxidase-coupled antibodies (cell signaling, France) used at 1:3000 dilutions according to the manufacturer’s protocol. Proteins were visualized with an enhanced chemiluminescence detection system (Biorad, France). Semiquantification was performed by densitometry using Image J software®. For simple 3D cell cultures 1 × 106 cells of either HMEC-1 or MDA-MB-231 were incubated with 10 hydrogels in 2 mL of modified culture medium per well. As for co-culture experiments 5 × 105 of both MDA-MB-231 and HMEC-1 were mixed in a 1:1 ratio and then cultured in 2 mL of modified culture medium with 10 hydrogels per well. 24 h later the culture medium was changed with fresh culture medium for both simple and heterotypic cultures, and secreted VEGF (R&D systems, France), MMP-2 and MMP-9 (Tebubio, France) were assayed by Elisa kits according to the manufacturer’s instructions on the second, fourth, sixth and twelfth day of culture. All experiments were performed in triplicate. The data were obtained using 2 way ANOVA test and data were considered to be statistically significant with p values ≤ 0.05. To identify the appropriate culture medium that could be used in the co-culture of both HMEC-1 and MDA-MB-231 cells without affecting the proliferation capacity of each, cells were cultured in control and modified culture medium, and the cell proliferation was tested by WST-1 colorimetric assay. 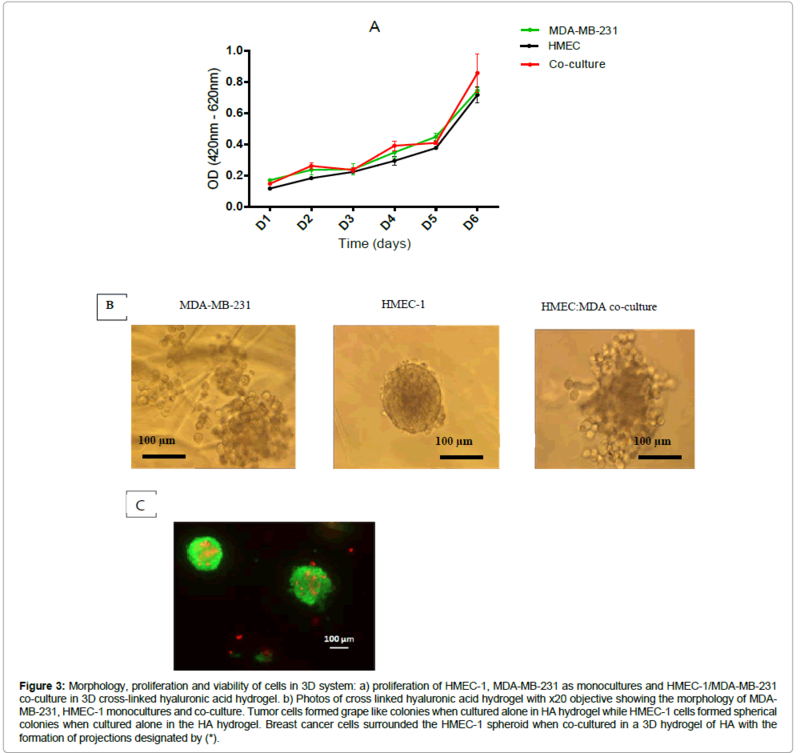 No change in the proliferative capacity of HMEC-1 cells was observed in both control and modified culture medium (Figure 1a). However, a significant decrease in MDAMB- 231 proliferation was observed on day 6 when modified culture medium was used (Figure 1b). Therefore we chose to continue our experiments using RPMI for both cell lines. Figure 1: Identification of an appropriate culture medium: A) HMEC-1 cell proliferation in control and conditioned culture medium. B) MDA-MB-231 cell proliferation in control and conditioned culture medium. 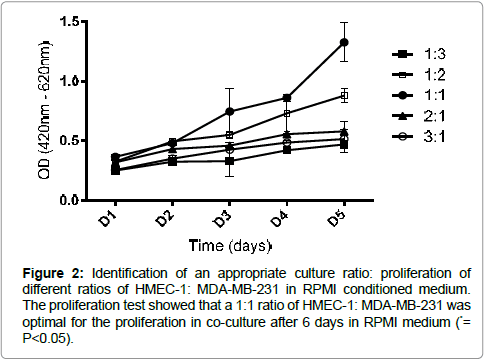 The proliferation test showed that MDA-MB-231 cell proliferation was significantly reduced after 6 days of culture in MCDB medium, while the HMEC-1 cell proliferative capacity was not changed when cultured in RPMI conditioned medium (*= P<0.05). HMEC-1/MDA-MB-231 co-culture in the cross-linked HA hydrogel was realized in different ratios in order to confirm the optimal ratio required for cell proliferation in our 3D co-culture system. We confirmed that a 1:1 ratio of HMEC-1: MDA-MB-231 was optimal for the cell proliferation in co-culture (Figure 2). Therefore we continued our experiments with 3D co-cultures in a 1:1 ratio. Cell proliferation of HMEC-1/MDA-MB-231 co-culture was compared to monocultures using the WST-1 assay. We observed that there was no change in the proliferation capacity between monocultures and co-culture in our 3D system within the period of 6 days (Figure 3a). Yet the proliferation pattern in HMEC-1/MDA-MB-231 co-culture resembled that observed in MDA-MB-231 monoculture. Figure 2: Identification of an appropriate culture ratio: proliferation of different ratios of HMEC-1: MDA-MB-231 in RPMI conditioned medium. The proliferation test showed that a 1:1 ratio of HMEC-1: MDA-MB-231 was optimal for the proliferation in co-culture after 6 days in RPMI medium (*= P<0.05). Cell viability was found to be 97% after 12 days of culture in both monoculture and co-culture models (data not shown). HMEC-1 cells alone or in co-culture were found to withhold a spheroid configuration in the hyaluronic acid hydrogel. Whereas MDA-MB-231 cells alone were found to possess a grape like configuration in monocultures (Figure 3b) while in co-cultures were found to form small masses surrounding the HMEC-1 spheroid with small projections of cancer cells (Figure 3c). Figure 3: Morphology, proliferation and viability of cells in 3D system: a) proliferation of HMEC-1, MDA-MB-231 as monocultures and HMEC-1/MDA-MB-231 co-culture in 3D cross-linked hyaluronic acid hydrogel. b) Photos of cross linked hyaluronic acid hydrogel with x20 objective showing the morphology of MDAMB- 231, HMEC-1 monocultures and co-culture. Tumor cells formed grape like colonies when cultured alone in HA hydrogel while HMEC-1 cells formed spherical colonies when cultured alone in the HA hydrogel. Breast cancer cells surrounded the HMEC-1 spheroid when co-cultured in a 3D hydrogel of HA with the formation of projections designated by (*). HMEC-1 and MDA-MB-231 co-culture was established in the hyaluronic acid hydrogel, cells were either both mixed in a 1:1 ratio and deposited directly onto the hydrogel or one cell type was left to migrate into the hydrogel 24 h before the addition of the second cell type. In all three conditions it was noticed that HMEC-1 cells migrate into the hydrogel forming spheroids near MDA-MB-231 acinar configuration. Subsequently, the MDA-MB-231 cells fold around the HMEC-1 spheroids. This process took a total of 12 h as observed under the time lapse microscope (Figure 4), irrespective to the plating order. This indicated that the organization of the cells in 3D coculture system would be constant no matter what sequence of seeding would be used. Consequently we have pointed out the presence of a cross-talk between breast cancer and endothelial cells in our in vitro 3D microenvironment which led to the maintenance of a certain cell rearrangement pattern. Figure 4: Time lapse microscopy imaging of MDA-MB-231/HMEC-1 co-culture in the hyaluronic acid hydrogel: The photos were taken with x5 objective during the first 24 h of co-culture. MDA-MB-231 cells (green) were marked by CMFDA cell tracer and HMEC-1 cells (red) were marked by CMPTX cell tracer. After 14 hours of culture, the MDAMB-231 cells are found to gather around the HMEC-1 spheroids forming micro-tumors of eccentrically located MDA-MB-231 and centrally located HMEC-1. We used protein array analysis to determine whether co-cultures in a 3D configuration could enhance the expression of angiogenic factors. The expression of Chemokines as CXCL-1, CXCL-2 and CXCL-3 was also observed in both day 6 and day 12 of culture, but these Chemokines were found to be prominently expressed in monocultures of MDA-MB-231. However, the chemokine RANTES or CCL-5, was found to be mildly upgraded at day 12 of co-culture and was absent in MDA-MB-231 monocultures as well as co-cultures at day 6. During day 6 of MDA-MB-231/HMEC-1 co-culturing in the hyaluronic acid hydrogel, the expression of IL-8 was found to be more prominent than that found in day 12. The MMP inhibitor TIMP-1 was shown to be expressed in MDA-MB-231 monocultures as well as in the MDA-MB-231/HMEC-1co-culture at day 6 but expression of TIMP-1 was found to be lower in co-cultures at day 12 (Figure 5). Interestingly, uPAR was observed to be expressed in the MDA-MB-231/HMEC-1 co-cultures at day 6 but not at day 12, which could be related to the migration of the cells in the hyaluronic acid hydrogel, in addition to the degradation of this scaffold during the first 6 days of culture. 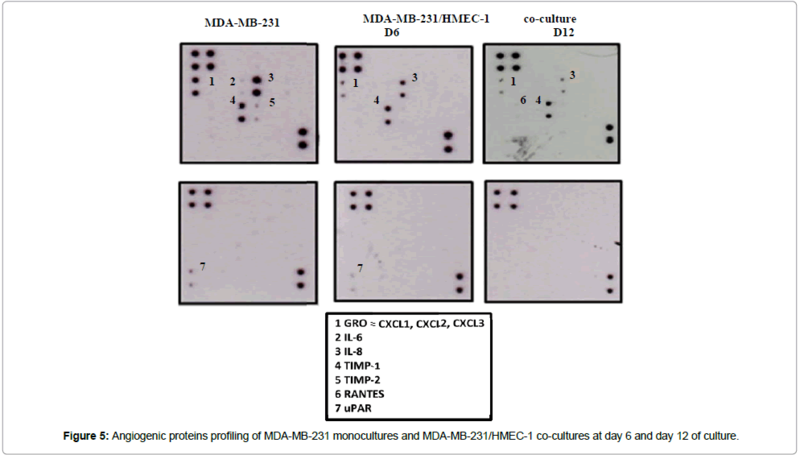 Figure 5: Angiogenic proteins profiling of MDA-MB-231 monocultures and MDA-MB-231/HMEC-1 co-cultures at day 6 and day 12 of culture. Secretion of angiogenic factors VEGF and MMP was quantified by ELISA after 24 h of serum deprived culture. The secretion of VEGF was found to decrease steadily in MDA-MB-231, HMEC-1 monocultures and MDA-MB-231/HMEC-1 co-culture within the first 6 days of culture in the hyaluronic acid hydrogel. However at day 12 of culture a slight increase could be found in the VEGF secretion (Figure 6a). As for MMP-2, the secretion was found to be quite steady in the MDA-MB-231 monoculture. 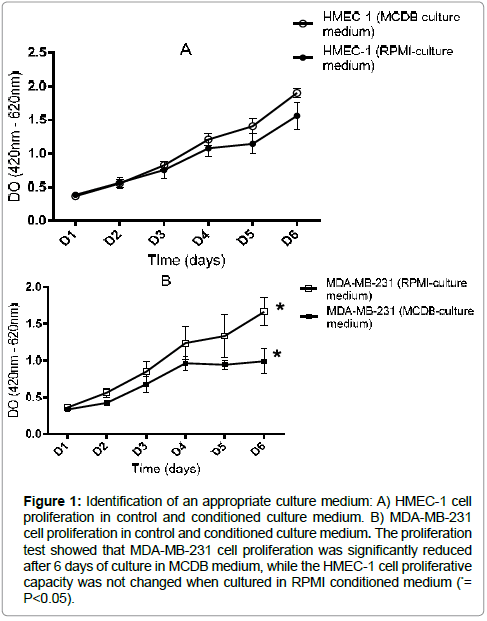 Moreover, interestingly in HMEC-1 monoculture and MDA-MB-231/HMEC- 1 co-cultures, MMP-2 secretion steadily decreased within the first 6 days of culture and was found to increase afterwards (Figure 6b). The latter could be correlated with the observation previously described for VEGF secretion. Whereas the secretion of MMP-2 by MDAMB- 231 monocultures seemed to be steady during the 12 days culture period. Additionally, the secretion of MMP-9 was found to steadily decrease during the first 6 days of co-culture, whilst being stable in monocultures. At day 12 the secretion of MMP-9 was also found to be increased (Figure 6c). Figure 6: Secretion of angiogenic factors by MDA-MB-231, HMEC-1 monocultures and MDA-MB-231/HMEC-1 co-culture in the HA hydrogel. Cell culture supernatants for each experimental group were collected at 2, 4, 6 and 12 day culture periods for ELISA. a) VEGF protein secretion measured for each group (pg. mL-1). b) MMP-2 secretion measured for each group (ng/ml). c) MMP-9 secretion measured for each group (pg.mL-1) (*P<0.05, **P<0.01, ***P<0.001). As in recent publications suggesting that cancer cells can proliferate or become dormant depending on the presence of an architectural influence of the microenvironment and factors such as the ERK/P38 ratio. Together with our previously mentioned results that show a relative decrease of cellular proliferation and secretion of angiogenic factors in MDA-MB-231/ HMEC-1 3D cocultures relative to 3D monocultures. We have hypothesized that in this reticulated hyaluronic acid hydrogel the MDA-MB-231/ HMEC-1 co-culture system could undergo certain quiescence due to its microenvironment. Thus we have investigated the balance between the ERK pathway and P38 pathway by western blot in order to understand the effect of the microenvironment on the MDAMB- 231/HMEC-1 co-culture and on the 3D monocultures. We founded that the expression of Erk/P38 was decreased when the breast cancer cells were co-cultured with the endothelial cells in comparison to breast cancer cell monocultures in our 3D microenvironment at day 6. However this expression is marked after 12 days of MDA-MB-231/HMEC-1co-culture and MDA-MB-231 monocultures in the 3D microenvironment when compared to the ERK/P38 ratio which was found to be steadily low in HMEC- 1 monoculture throughout the whole culture period (Figure 7). This could reflect the effect of the reticulated hyaluronic acid microenvironment on the proliferation of the cell lines alone or in co-culture. 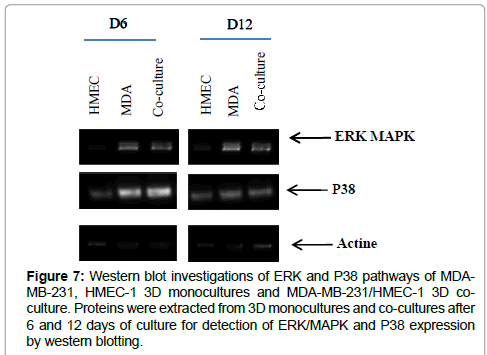 Figure 7: Western blot investigations of ERK and P38 pathways of MDAMB- 231, HMEC-1 3D monocultures and MDA-MB-231/HMEC-1 3D coculture. Proteins were extracted from 3D monocultures and co-cultures after 6 and 12 days of culture for detection of ERK/MAPK and P38 expression by western blotting. To date, the most successful tissue engineering approaches have employed methods that recapitulate the composition, architecture and chemical presentation of the native microenvironment. For this, studying tumors in the 3D system has been proven far more accurate in reproducing in vivo growth characteristics and chemotherapeutic resistance than 2D approaches. Tumor growth, invasion and metastasis are sustained not only by cell-matrix and intra-cell interactions but can also be due to the interactions between malignant and non-malignant cells as fibroblasts, endothelial cells, adipose cells and other stromal cells. Thus tumor engineering in biomimetic 3D conditions represents a dynamic co-operativity between different cell types in a spatially and functionally accurate fashion. Heterotypic scaffold free aggregates of tumor-endothelial cells have been reported in the literature [5-20]. Meanwhile, the limitation in these scaffold free tumor engineering models is that they lack cell-matrix interactions, in addition to their effect on cell survival and proliferation. Our tumor-endothelial co-culture model in a cross-linked hyaluronic acid hydrogel allows the migration of both cell types in the hydrogel by the presence of CD44 and/or RHAMM surface receptors on both cell types [21,22]. This cell mobility during cell assembly enables intracellular organization compatible to that seen in vivo. Additionally, cell growth exhibited a characteristic exponential phase during the 6 days of culture with 100% cell viability especially within the first 6 days of the culture period. This could be due to the free diffusion of nutrients and oxygen as well as waste products through the intercommunicating scaffold pores with an average diameter of 227 × 234 μm . The acinar configuration of breast cancer cell monoculture in the hyaluronic acid scaffold has also been described by Campbell et al. as they showed that this conformation would be dependent on the percentage of hyaluronic acid in their scaffold . Inter-cellular assembly in the HA hydrogel showed that endothelial cells have the tendency to be located in the core of the malignant cells, independent of the order of seeding. This cell behaviour may be linked to the chemotactic effect of chemokines produced by the endothelial and tumor cells, leading to a reciprocal communication and organization of both cell types. The central localization of the endothelial cells in spheroids has already been reported by Timmins et al. where endothelial cells have a tendency to migrate into hepatocellular carcinoma cell line spheroids. Angiogenic protein profiling of the cells on monocultures or in co-culture revealed the expression of IL-6 and TIMP-1 which could only be found in the co-cultures. Thereby this could be associated with the fact that TIMP-1 has been reported to be overexpressed in many malignancies including breast cancer and is associated with poor prognosis . Additionally Bigelow et al. have highlighted the different effects of TIMP-1 expression in 2D compared to 3D environment in tumor progression. This could be correlated to the similarity of the MDA-MB-231 monoculture in a 3D system to very early staged micro-tumors in vivo, which have not yet recruited endothelial cells for neo-angiogenesis. Additionally, IL-8 which is one of the pro-angiogenic factors and chemokines such as CXCL- 1, CXCL-2 and CXCL-3 were found to be expressed abundantly in monocultures whereas in co-cultures they fainted during the culture period. This also could be due to the fact that within the first 48- 72 h cells have the tendency to migrate within the hydrogel aided by the interaction between the CD44 and/or RHAMM receptors [26,27]. In order to facilitate cell migration and proliferation in the hydrogel, degradation of the scaffold must take place. The Urokinaseplasminogen activator receptor (uPAR) plays an important role in migration, proliferation and angiogenesis of tumor cells. It has been reported that down regulation of uPAR expression in cancerous cells attenuates tumor growth, accompanied by decreased cellular migration, invasion and adhesion . As uPAR may bind to uPA which in turn activates plasminogen to the extracellular protease, plasmin, which catalyses degradation of the extracellular matrix. In our experiments MDA-MB-231 monocultures showed low expression of uPAR. Studies have indicated that down regulation of the uPA activity or the uPA-uPAR interaction may lead to a change in tumor growth and metastasis. This has been previously correlated with the osteopontin expression by MDA-MB-231cells by Mi et al. where osteopontin was also found to play an important role in the invasive behaviour, 3D growth ability as well as the induction of expression of angiogenic factors by these tumor cells . However the expression of uPAR was attenuated after 6 days of MDA-MB-231/ HMEC-1 co-culture and disappeared completely after 12 days of coculture. In head and neck carcinoma it has also been reported that blocking uPAR can lead to tumor suppression in vivo which is due to induction of dormancy. The disruption of uPAR complex may activate the p38 mitogen activated protein kinase (MAPK) signaling pathway leading to the arrest of cell cycle thus to cell dormancy. We further quantified the secretion of VEGF and MMP in each culture condition, revealing a diminution in the secretion of VEGF and MMP-2. This could be explained by the fact that cells may sense their architecture and interact with their microenvironment leading to this angiogenic switch. This was also observed by Chen et al. who reported that in the breast tumor microenvironment malignant cells when polarized may lead to suppression of VEGF expression and other angiogenic factors in reverted cells. Thus the expression of angiogenic genes may be restrained when cells adopt polarized tissue morphology . Another hypothesis, which would require further investigation, for the down-regulation of VEGF and MMP-2 during the first 6 days could be due to the up-regulation of the protease inhibitor, tissue inhibitor of MMP-2 (TIMP-2). It has been shown in early primary growth of breast cancer that TIMP-2 controls MMP proteolysis which may be directly linked to an antiangiogenic activity by inhibiting endothelial cell proliferation and/ or down-regulating VEGF production . However the protein profiling showed that co-culturing the cells in our hydrogel led to the disappearance of TIMP-2 expression. Therefore we have favoured the hypothesis that MDA-MB-231 cell characteristics are dependent on their microenvironment. All these results lean toward the illsuited microenvironment for the breast cancer cells leading to their dormancy when co-cultured with endothelial cells. As our culture system consists of only hyaluronic acid which is not considered to be representative of the diversity and structural complexity of the extracellular matrix which may be required to retain functional ability of the cells proliferate. Therefore further studies may be necessary in optimizing the components of our scaffold rendering it more suitable for generation of a long term, robust and effective in vitro cell culture system that compromises the diversity and complexity of in vivo cell organization. This work was financially supported by L’Agence nationale de la recherche (ANR-1-EMMA-040-02) and by Vie et Espoir association. Jaganathan H, Gage J, Leonard F, Srinivasan S, Souza GR, et al. (2014) Three-dimensional in vitro co-culture model of breast tumor using magnetic levitation. Sci Rep 4: 64-68. Al Tawil E, Monnier A, Nguyen QT, Marais S, Kassim Y, et al. (2015) Material for cell cultivation, production methods and uses thereof PCT/FR2015/050441. Petersen OW, Ronnov-Jessen L, Howlett AR, Bissell MJ (1992) Interaction with basement membrane serves to rapidly distinguish growth and differentiation pattern of normal and malignant human breast epithelial cells. Proc Natl Acad Sci USA 89: 9064-9068. Ghajar CM, Bissell MJ (2010) Tumor engineering: The other face of tissue engineering. Tissue Eng Part A 16: 2153-2156. Buchanan CF, Szot CS, Wilson TD, Akman S, Metheny-Barlow LJ, et al. (2012) Cross-talk between endothelial and breast cancer cells regulates reciprocal expression of angiogenic factors in vitro. J Cell Biochem 113: 1142-1151. Chen A, Cuevas I, Kenny PA, Miyake H, Mace K, et al. (2009) Endothelial cell migration and vascular endothelial growth factor expression are the result of loss of breast tissue polarity. Cancer Res 69: 6721-6729. Krause S, Maffini MV, Soto AM, Sonnenschein C (2008) A novel 3D in vitro culture model to study stromal-epithelial interactions in the mammary gland. Tissue Eng Part C Methods 14: 261-271. DelNero P, Lane M, Verbridge SS, Kwee B, Kermani P, et al. (2015) 3D culture broadly regulates tumor cell hypoxia response and angiogenesis via pro-inflammatory pathways. Biomaterials 55: 110-118. Tlsty TD (2001) Stromal cells can contribute oncogenic signals. Semin Cancer Biol 11: 97-104. Correa de Sampaio P, Auslaender D, Krubasik D, Failla AV, Skepper JN, et al. (2012) A heterogeneous in vitro three dimensional model of tumour-stroma interactions regulating sprouting angiogenesis. PLoS ONE 7: e30753. Bray LJ, Binner M, Holzheu A, Friedrichs J, Freudenberg U, et al. (2015) Multi-parametric hydrogels support 3D in vitro bioengineered microenvironment models of tumour angiogenesis. Biomaterials 53: 609-620. Janvier R, Sourla A, Koutsilieris M, Doillon CJ (1997) Stromal fibroblasts are required for PC-3 human prostate cancer cells to produce capillary-like formation of endothelial cells in a three-dimensional co-culture system. Anticancer Res 17: 1551-1557. Chwalek K, Bray LJ, Werner C (2014) Tissue-engineered 3D tumor angiogenesis models: Potential technologies for anti-cancer drug discovery. Adv Drug Deliv Rev 80: 30-39. Fischbach C, Kong HJ, Hsiong SX, Evangelista MB, Yuen W, et al. (2009) Cancer cell angiogenic capability is regulated by 3D culture and integrin engagement. Proc Natl Acad Sci USA 106: 399-404. Demange E, Kassim Y, Petit C, Buquet C, Dulong V, et al. (2013) Survival of cord blood haematopoietic stem cells in a hyaluronan hydrogel for ex vivo biomimicry. J Tissue Eng Regen Med 11: 901-910. David L, Dulong V, Le Cerf D, Cazin L, Lamacz M, et al. (2008) Hyaluronan hydrogel: An appropriate three-dimensional model for evaluation of anticancer drug sensitivity. Acta Biomater 4: 256-263. David L, Dulong V, Le Cerf D, Chauzy C, Norris V, et al. (2004) Reticulated hyaluronan hydrogels: A model for examining cancer cell invasion in 3D. Matrix Biol 23: 183-193. Simon T, Coquerel B, Petit A, Kassim Y, Demange E, et al. (2014) Direct effect of bevacizumab on glioblastoma cell lines in vitro. Neuromolecular Med 16: 752-771. Prestwich GD, Marecak DM, Marecek JF, Vercruysse KP, Ziebell MR (1998) Controlled chemical modification of hyaluronic acid: Synthesis, applications and biodegradation of hydrazide derivatives. J Control Release 53: 93-103. Upreti M, Jamshidi-Parsian A, Koonce NA, Webber JS, Sharma SK, et al. (2014) Tumor-endothelial cell three-dimensional spheroids: New aspects to enhance radiation and drug therapeutics. Transl Oncol 4: 365-376. Hamilton SR, Fard SF, Paiwand FF, Tolg C, Veiseh M, et al. (2007) The hyaluronan receptors CD44 and Rhamm (CD168) form complexes with ERK1,2 that sustain high basal motility in breast cancer cells. J Biol Chem 282: 16667-16680. Ades EW, Candal FJ, Swerlick RA, George VG, Summers S, et al. (1992) HMEC-1: Establishment of an immortalized human microvascular endothelial cell line. J Invest Dermatol 99:683-690. Campbell JJ, Davidenko N, Caffarel MM, Cameron RE, Watson CJ (2011) A multifunctional 3D co-culture system for studies of mammary tissue morphogenesis and stem cell biology. PLoS ONE 6: e25661. Timmins NE, Dietmair S, Nielsen LK (2004) Hanging-drop multicellular spheroids as a model of tumour angiogenesis. Angiogenesis 7: 97-103. Egeblad M, Werb Z (2002) New functions for the matrix metalloproteinases in cancer progression. Nat Rev Cancer 2: 161-174. Bourguignon LY, Singleton PA, Zhu H, Zhou B (2002) Hyaluronan promotes signaling interaction between CD44 and the transforming growth factor beta receptor I in metastatic breast tumor cells. J Biol Chem 277: 39703-39712. Balsara RD, Merryman R, Virjee F, Northway C, Castellino FJ, et al. (2010) A deficiency of uPAR alters endothelial angiogenic function and cell morphology. Vasc Cell 3: 10. Mi Z, Guo H, Russell MB, Liu Y, Sullenger BA, et al. (2009) RNA aptamer blockade of osteopontin inhibits growth and metastasis of MDA-MB231 breast cancer cells. Mol Ther 17: 153-161. Remacle A, McCarthy K, Noël A, Maguire T, McDermott E, et al. (2000) High levels of TIMP-2 correlate with adverse prognosis in breast cancer. Int J Cancer 89: 118-121.